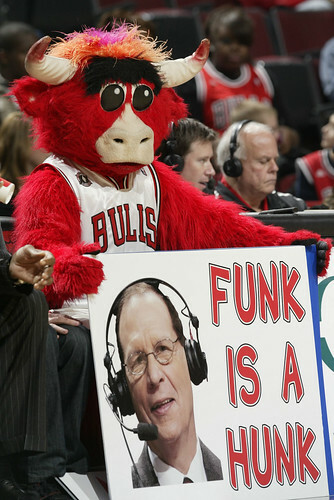 The Bulls’ runaway 113-82 victory over the Minnesota Timberwolves Saturday night in the United Center was the kind of game the team might like to sing about. Perhaps some combination of “Takin’ Care of Business,” that being the firing on all cylinders Saturday win, to “This Could be the Start of Something Big,” the upcoming schedule that starting Monday at home against the Pacers has the Bulls playing just one team with a winning record, the Knicks on Christmas Day, in the next 13 games. This is a good time to begin developing that as the Bulls seem healthy, motivated, and playing their best ball of the season with a fifth consecutive win, yielding an average of 84.8 per game in the last four, following Derrick Rose’s lead as the prodigy led the Bulls with 21 points, seven assists and a career high five three pointers in six attempts (13 of his last 20), and in excellent position to propel themselves into the upper echelon of the East at 14-8. That’s the most over .500 the Bulls have been in almost four years, and it could get a lot better, especially the way the Bulls came out and put away the Timberwolves. Michael Beasley, who had 16 points, just put his head down and went to the basket every time he had the ball. I was checking to see if his two assists were a career high. Really, who was saying the Bulls needed an inside scorer in that draft and needed Beasley? C’mon, you know who you are. I know Minnesota coach Kurt Rambis studied under Phil Jackson in L.A., but that didn’t mean he had to sit mostly expressionless all game. Maybe he felt if he’d get up assistant Bill Laimbeer would trip him out of playing habit. Of course, when you are from Minneapolis and you come to a 36-degree day like Chicago had Saturday, it’s difficult not to want to relax and get out the reflectors. Was that ‘wolves players remarking with the two inches of snow after the game that they’d never seen so little? 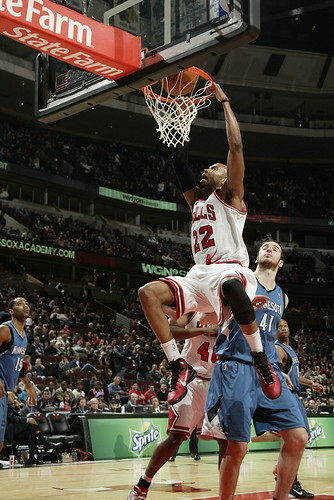 It truly was a masterful effort and Rose was again sensational, if also efficient with 21 points on 10 shots. He is now shooting 41 percent on threes for the season, good enough usually to get you in the All Star three point shooting contest. He said he’d be good. We all doubted him, like about being the league MVP, and there he goes again. His three pointer now looks like the most reliable shot on the team. No one apparently had told Timberwolves guard Luke Ridnour, who kept giving Rose plenty of room while mostly standing at attention on defense. I have to compliment the ‘wolves for their military like discipline on defense the way they don’t move much and have their arms by their sides. Are we done with this urban legend yet that Rose can’t shoot? It’s official. Rose no longer can be defended. Meanwhile, Luol Deng had the good fortune to have Beasley guarding him, in a manner of speaking. Look, there aren’t many good defenders, just like it’s almost impossible to stay with a great receiver in football. But small forwards send a limo for Beasley to make sure he doesn’t miss the game. I assume he figures it out a bit as he’s finally just beginning to get serious playing time after two lost seasons in Miami. But at least buy a program to see whom you have. Deng, who finished with 19 points on seven of 11 shooting in a wonderful comeback season, got the Bulls off fast with nine points in the first quarter. 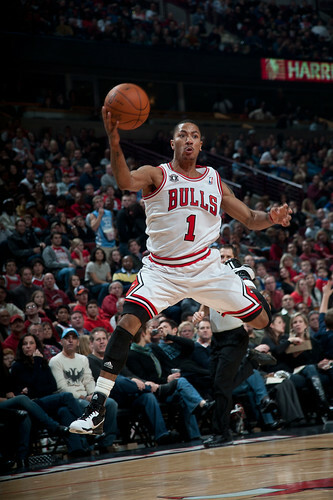 First quarters have been somewhat confusing this season with slow starts as Rose tries to get teammates involved. 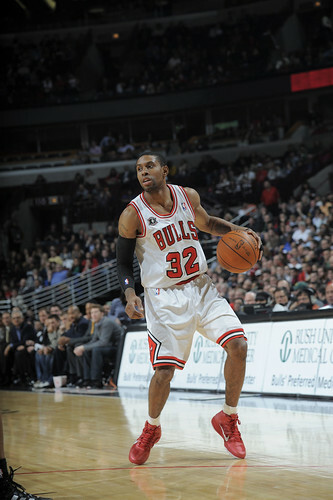 But this time, the Bulls were attacking the basket, getting into some transition and strong with their defense. 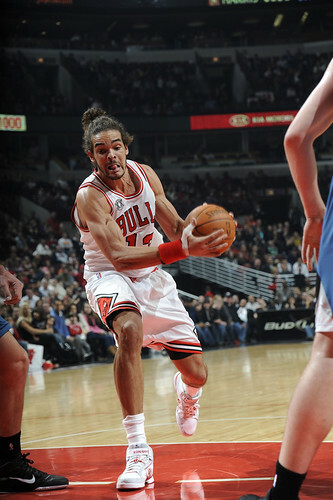 I’ve thought of late, especially to open games, the help has been a little slow, sometimes Noah and especially Boozer. 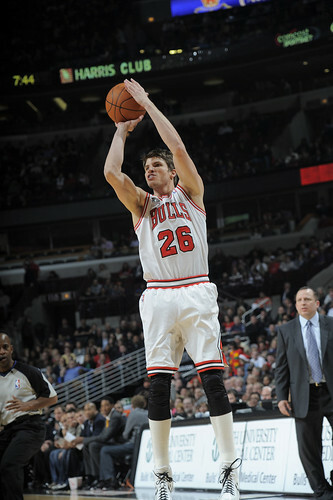 But Noah was into this game with a season high six blocks and two steals to go along with nine points and 10 rebounds. He drove Darko Milicic, who has been having a good season, out of the game on fouls along with Boozer, who is rounding into shape and had 17 points and seven rebounds. Boozer’s defense has been somewhat suspect, and it’s hurt the Bulls to start along with Keith Bogans, who has had trouble containing the quicker shooting guards. But Minnesota went with a rookie two, Wesley Johnson, who was off to start, and Bogans made a pair of threes to get a bit of heat off him for now. He’s been the subject of fan and media ire, though his playing time has been reduced and he generally plays about 10 to 15 minutes these days, hardly enough to account for any losing streak. 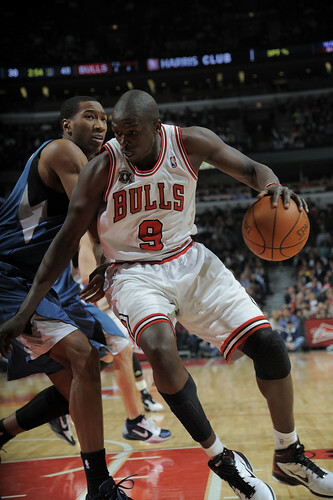 But, actually, with five straight wins now I’d be surprised to see Thibodeau make any changes to the starting lineup. Coaches tend to be superstitious, sort of the thing about not messing with a streak, as Crash Davis said in Bull Durham. And with the Bulls on a season best five in a row, Thibodeau is unlikely to make any substantial, or, at least, visible changes. Though I believe he is changing his socks. Thibodeau does continue to tinker with the rotations, and with the Bulls winning easily Saturday he got to sit the starters the entire fourth quarter. Minnesota came in the No. 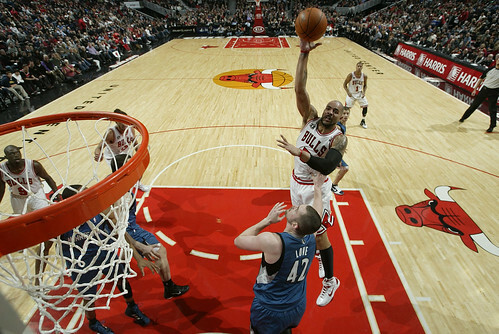 1 rebounding team in the NBA, but the Bulls dominated them 53-36 in getting 17 offensive rebounds, seven from Taj Gibson. Actually, the second unit, while relatively bereft of scoring so somewhat overlooked, has been playing better defense of late than the starters, which should be no surprise as Gibson is a better defender than Boozer and Brewer better than Bogans. The Bulls broke open the game with an all-reserve team to open the second quarter, like they did in getting back into the game against the Lakers Friday, and the Bulls stretched the lead to 38-20 in the first five minutes with an 11-2 run. It was pretty much over after that as the ball moved beautifully with 28 assists on 41 field goals with everyone on the team, including late playing additions James Johnson and Kurt Thomas, also getting assists. Well, maybe not Minnesota on a night like this in their third game in four nights. 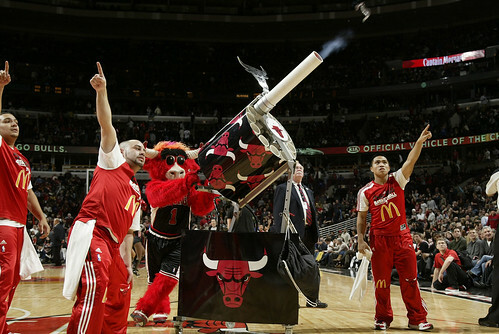 The Bulls’ plan actually was fairly simple. They just decided to play better and harder. Well, not quite that elementary, but made somewhat easier by the lack of Minnesota roster depth with no significant perimeter threats. Love is a marvel the way he makes up for what he lacks in athletic talent with fundamental play, positioning, reading the plays, boxing out, stepping out when uncovered. Don’t underestimate it if you want to succeed. The kids who run and jump faster and higher don’t always win. But not good enough to carry that team. So the Bulls stayed away from tricks. They played a pretty straight forward defense, protecting the paint as best they could and not doubling as much as they had been in some previous games when they continually left the perimeter uncovered. Noah and Omer Asik were good rotating to help and stay big, forcing the Timberwolves out of the paint or into mistakes, 21 turnovers for 27 points, 13 turnovers in the first half when the Bulls led 58-37. The Tmberwolves got a few scores coming out of halftime to cut the deficit to 14. But Bogans, Rose and Deng hit threes in the next two and a half minutes to get the lead back over 20 and it pretty much stayed there and increased with the reserves in the fourth.